After a week off, it’s time to get back on the grind. While there were PPTQ’s last week, they were well outside my willingness to travel. I instead used that time to refine my decks and get a feel for where the metagame was going. I intended to hit both Modern PPTQ’s this weekend, but due to traffic I missed the Saturday event and only played on Sunday. My quick take on the Pro Tour: don’t read too much into the results. It’s a team event and a Pro Tour, so every result is distorted. The former means that a deck’s placing isn’t necessarily indicative of its own performance or power, but on the rest of the team. The latter means that players were heavily metagaming against other Pro Teams with the assumption that Humans would be heavily played. It’s fun to ogle all the decklists, but I wouldn’t assume they’re indicative of what’s actually good. Once again, I didn’t have any particularly outstanding deck for the weekend. Both UW Spirits and Jeskai Tempo were doing well for me, but both have their bad matchups that cycle in and out of the metagame. Tron is declining locally while Collected Company decks were returning after months away, a negative for Spirits and plus for Jeskai. I was also still undecided on the flex slots for Spirits; Reflector Mage was fine, but it didn’t shine. I was definitely leaning Jeskai as my default this week. Once I arrived at the tournament site, I realized Company was far more popular this week than expected. Over half of the players I recognized were dedicated Company pilots. Watching deck registration and practice games showed there was also a surplus of graveyard-heavy decks and Eldrazi. The former deck is good but not exceptional for Jeskai, while the other two are mediocre at best. Given this field, I felt that my best bet was to avoid fighting fair and sleeved up Storm. I’ve diversified the answer package so I can Gifts for answers and always have two. I know that Bolt is seeing more play in Storm sideboards, but Humans is rare in Colorado. Against the other creature decks, the main plan is to just race and I already have plenty of answers maindeck for Eidolon of the Great Revel or Eidolon of Rhetoric. Jund and Jeskai are popular enough that I still want Blood Moon, despite the card’s seeing little play in other Storm decks. The site was a store that I thought closed last year. It’s been through a lot of managerial drama and moved locations. Despite all that, there was just enough room to comfortably seat all 47 players. I was surprised that the turnout was that low compared to last time, especially considering it was centered in a Magic hotbed, but it was the third PPTQ that weekend. There was also an excess of ventilation, so it was almost too cool inside for players to stay indoors. My scouting was accurate: about a third of the room was on some Company deck. In past years, Company was a very popular deck, but its share has been declining for some time. Part of that may be a number of Company pilots have been playing less and just came back for PPTQ season. However, the card did win a PPTQ last week, so it’s equally possible that it was the flavor of the week. In any case, it was getting picked apart. There were a lot of non-typical Eldrazi decks present, along with different versions of control. The graveyard decks were fewer than I thought based on scouting, but every flavor was present, from true Dredge to BR Vengevine. I’m feeling very proud of my room-reading and deck choice when I’m paired against a Company-playing long-time nemesis round one. However, things went downhill after that win. I lose to Ironworks, BR Hollow One, and Jund before dropping. I just came up short. Literally. I was one mana short of lethally comboing Games 1 and 3 against Ironworks. I was a spell (any spell) short of beating Jund in Game 1, and a land short in Game 2. The Ironworks games in particular I felt like I could have won, but I couldn’t figure out how in the moment. It was a tournament where I felt like I was just slightly out of my depth. I’m not sure that I actually could have won, but I definitely feel like I could have if I were a real Storm player. Round one was easy. I wasn’t really under pressure, so I Abraded his Devoted Druid to not get cheesed, and went off several turns later once certain I wouldn’t fizzle. Game 2 saw more of the same, only this time I had to answer Damping Sphere. Fortunately, I just played around it with sorcery cantrips on my turn, followed by Opt and Gifts Ungiven on his. I sculpted until I couldn’t fail to remove Sphere and went off. Sphere is only good backed by a clock. Round two was hard, especially because my opponent had played Storm before switching to Ironworks. As a result, he knew exactly how to split my Gifts given the situation, and how to maneuver around me. He was also playing Path to Exile in addition to sideboard removal, which made things much harder. In Game 1, we both sculpted for many turns. I couldn’t go off and he was playing around Remand, which I didn’t have. We reached a point where he could get Ironworks down through Remand, so he was certain to go for it; therefore, I had to go first. He had out Pyrite Spellbomb, so my Goblin Electromancer was sure to die mid-combo, but if I hit either an untapped land, ritual, or Baral off of chained Manamorphose, I could win anyway. I didn’t, and he untapped and killed me. Game 2 was a drawn-out affair. He stopped me from comboing off twice by killing my enabler, leaving me short, but I stopped him by Vandalblasting his Ironworks in response to Scrap Trawler. My last card was Past in Flames, and I had enough lands to untap and combo without an enabler. For Game 3, I had access to a turn-three kill as long as he failed to kill my enabler. He did with Path, but I again had outs: finding another ritual through chained Manamorphose would yield a win. I didn’t, and so set up to win the following turn. My opponent denied me that turn. Round three was against BR Hollow One, and I felt helpless. In Game 1, he dumped his hand on turn two after wrecking me with a Burning Inquiry. In Game 2, I had to navigate around Leyline of the Void and multiple discard spells, but he didn’t have a clock; I eventually sculpted into two massive Empty the Warrens for the win. Game 3 saw another Leyline, which denied me a fast kill; Burning Inquiry took my backup plan. Nothing happened for so long that my opponent found time to play all his Faithless Lootings and eventually find the means to kill me. There were a number of decision points where I felt in retrospect the line I took was wrong, but I’m not sure why and I don’t know what I should have done differently. Round four against Jund was a bit of a gimp match. We both mulliganed both games, and my mulligans are punished with lots of discard spells. I could have won Game 2 if I’d drawn the land to Blood Moon him out of the game before he found another discard spell, but I didn’t. Neither of us drew very well, but his cards are better than mine; in a game of handicapped Magic, the raw-power deck is advantaged. Storm is a hard deck. It can win any game on the back of its power. It may also just fall apart. The hardest part is knowing which hands are real keeps in the situation. The second is knowing when to wait and when to just go for the win. I consider myself a decent Storm player, but by no means an expert. I didn’t have to be anything other than decent to win round one, in which I had all the time in the world. I feel like a more experienced pilot could have found the winning lines I didn’t against Ironworks and Hollow One. For example, in round three, Game 3, I had the choice of Repealing either Engineered Explosives or Flameblade Adept in response to Burning Inquiry, hoping he discards one. Taking Explosives means Empty the Warrens is an option, but I don’t have one in hand, nor could I storm for very much at the time. Bouncing Adept would remove my opponent’s clock and blank the Flamewake Phoenixes from his graveyard so I’d have more time to sculpt and kill with Grapeshot. I took Adept which he did discard, but I never drew enough relevant spells afterward to win. However, I don’t know if I was supposed to go for Explosives to open up Warrens or just not Repeal anything. I did have Warrens at the end, but I couldn’t storm for very much. Again, it may not be relevant, but a better Storm pilot would know. The lesson here is that I need to get more practice in with all my decks. I’m proficient with Storm; that’s not the same as being good. I was trying to sneak in a victory by going somewhat rogue, but Storm isn’t such a sneaky deck anymore. If I want to do that, I’ll need Bogles or Dredge. On the one hand, having the additional Gifts targets was extremely useful. I won Game 2 against Abzan Company after Gifting for four answers to save myself from the Vizier combo and also answer Damping Sphere. On the other, it felt like I was running a pile of compromises. 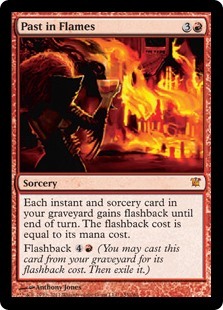 I also realize that this is becoming the norm, but this weekend left me with the impression that Modern may have caught up to Storm, and now it just isn’t enough. The deck’s overall strength hasn’t diminished and I’m still fine including it in my arsenal, but there’s some niggling feeling that it’s now behind the curve. I’ll be exploring this feeling and trying to identify the problem during the week. I won’t be making any build changes until I have some idea why I feel down on the deck. I am happy that I ran Storm, despite what I just said and my final result. Given the field, I definitely dodged a lot of very poor matchups by playing Storm, and also gave myself some rogue factor. Storm has never been a popular Modern deck in Colorado and players aren’t that comfortable attacking it as a result. Another week down, but my season lasts into September. The question for me next week is finding the confidence in my decks so I’m not still choosing them right before the tournament start. And getting more practice in. Still, the season grinds on, and I will too next week. Hey David. I was looking back on one of your older articles looking at the 600+ test games you did to assess if SFM was safe to unban and you arrived at the conclusion that it would warp the format causing aggro decks to go faster in order to close out the game before Batterskull came down. How do you feel about SFM now that Jace and BBE (giving reason to still play Jund/non white mid range) have been unbanned and now that we naturally already saw two blazing fast aggro decks emerge (Hallow One and the ever popular Bridgevine). Is now the safe time to unban SFM seeing as we are already at the meta state you worried that SFM would create, thus essentially having no to little impact? You’re asking the wrong question. It’s not about the short term metagame or immediate impact. The needle is constantly moving in Modern, and right now the metagame looks to be moving towards graveyard decks and large creatures and yes, that does make turn three Batterskull look mediocre at best. However, that won’t always be true. The question is whether the metagame can handle Stoneforge when busted linears aren’t in vogue. When things mellow out, would Stoneforge be a positive or negative for Modern’s diversity? I can’t say for certain what Stoneforge would do, but I do know that it puts a severe roadblock to any deck looking to fight on the same axis as Batterskull. It would be inadvisable to play any ground attacking traditional aggro deck because Batterskull is a pretty clean answer. This would push decks to either go under Batterskull or pick a different battle. It is possible this would work out, for example more players planning for grindier midrange games involving equipment ala Legacy Stoneblade, while aggro decks take to the skies ala Spirits. It is equally possible that it stops players wanting to play creature aggro at all and instead polarizes the format between decks that can fight ‘skull equitably (midrange and control) and decks that ignore it (combo and Infect). The question isn’t whether Modern can handle it right now, the question is whether it incentivizes a metagame that is good for Modern. As for Twin, I doubt I’ll be testing it because it’s not easily testable. Twin wasn’t banned because it was necessarily too powerful but because there just wasn’t much reason to play a non-Merfolk blue deck that wasn’t Twin. It could play midrange or combo games and was just better than everything else. Why play Storm when Twin can fight hate more easily? Why play control and win eventually when you can just win turn four? That effect is really hard though not impossible to statistically test, but the real killer is logistics. Getting a statistically significant sample size is hard enough for the normal tests, gathering significant samples from multiple decks to prove that whether Twin is just better is prohibitively challenging. Thank you for the reply and I agree with you point of looking at the meta game in the long term. I hadn’t considered how things would shake out after the meta adapts to Hollow One and Bridgevine and those decks decline in popularity. Where as SFM’s constant presence, if unbanned, would be something to always consider when constructing decks and tweaking sideboard. As for Twin you also make great point and one that I forgot to consider is how versatile the deck was and how rendered any other blue deck inferior options. I remember it used to occupy and unhealthy % of the meta for that reason. I just kept thinking about how he have so many options to combat Twin, however, as you mentioned that isn’t the problem. For that reason and in attempts to maintain format diversity I can see Twin not ever being unban. As much as I miss playing against that deck, it is a necessary evil that it remain banned.